When should I visit the dental clinic in Delhi? For any kind of dental related consultation, you are welcome always for the expert advice of the dentists in Delhi. It might not be for any kind of problem, but simply for understanding the common practices in dental hygiene maintenance, you can walk into our dental clinic in Delhi. For major surgical interventions, consultations with the concerned specialists are required and therefore, you need to take up appointments before visiting the clinic. What are the different kinds of dental treatment facilities available at ZENTAL in South Delhi? When patients visit our dental clinic in Delhi, they have variety of dental problems in their teeth. It might be simple infections in the gum tissues or major surgeries might be required for maxillofacial or trauma patients. So, in our clinic, we strive to cater to a number of patients by having multispecialty departments in the clinic. Hence, there are diseases related to endodontics, prosthodontics, paedodontics and community dentristry. 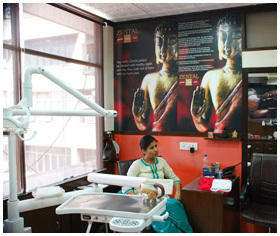 For the number one dental clinic in Delhi, we have given our best offices for the comfort of the patients. Can I get a dental implant done in your clinic? Since we have high end dental materials and supplies stacked up, high quality materials of dental implants are available. Due to the expertise of our dentists in handling highly imported as well locally designs are able to be found. These fittings are quite durable and are done with the right process. Are there any procedures before extraction or other surgeries? When the extractions are being done, there is probability of pain in the root canals. So, our aim is to provide the dental patients with best quality treatments, so that there is no pain or stress son the jaws. Is there any chance of the injuries being recurred later? With high quality hygiene being processed in the clinics, the patients do not have any chance to get infections. But, ideally, suitable anti infection drugs are to be prescribed.